Although many of Lady Duff-Gordon's claims to originality and innovation are now discredited, her high-end dressmaking firm Lucile remains a potent example of early British couture. Although at the forefront of designing and merchanting clothes for society women at the turn of the twentieth century, these skills were eclipsed by her talent for literary biography demonstrated by the entertaining autobiography Discretions and Indiscretions (1932) that was intended to cement her reputation with a light, literary style of prose. Divorced from an alcoholic husband and with little formal education, Lady Duff-Gordon persuaded her mother in 1889 to save her reputation by financially backing her as a dressmaker, capitalizing on her only practical skill of sewing. Her first design was based on a tea gown, inspired by a dress worn by an actress on stage. It became her calling card for society ladies and was worn by the Hon. Mrs Arthur Brand on the occasion of her staying with a society hostess. The tea gown originated as a garment worn by society women when in the country, after they had de-robed from their shooting tweeds and before donning evening dress for dinner. This practice is considered to have followed on from them being solely worn for the purpose of taking tea. Set between function and formality the loose and uncorseted style of the garment implied, if not a state of undress, then at least a private and introspective state on the part of the wearer. Duff-Gordon seized on the risqué potential of the tea gown as a way of challenging late Victorian London's views on modesty and morality in women's dress, while championing her own cause for notoriety. This led her to be accused of peddling the cult of immoral dressing (Etherington-Smith 1986, p. 73). The association of the tea gown with refreshment and sociability between women became actively embedded in the business, most notably at Maison Lucile, her Hanover Square shop at no. 17 opened in 1897 (no. 23 opened in 1901). Duff-Gordon's belief that "nobody had thought of developing the social side of choosing clothes, of serving tea and imitating the setting of a drawing-room" informed her idea of a commercial space for the selling of clothing appearing as a space of leisure and, to some degree, domesticity. However, it was her skill in innovative sales techniques that helped to establish a glamorous cult of personality for both the designer and her committed clients. Lucile's business was unusual in that it also was well known for designing theatrical dress for the stage. Many of the features of dress design that Lucile became renowned for, such as the delicate layering of fabrics, fusions of color, and use of filigree and trim, were very much learned from the traditions of theatrical dress design that were engineered to catch the floodlights and project the performer. Yet it was in her efforts to create a theatrical setting in her own salon for the presentation of her latest designs for the fashionable woman that Duff-Gordon excelled. From a small stage hung with olive-colored chiffon curtains, she presented collections on models that she personally trained in deportment, each one bearing a dress with a literary title rather than a number. 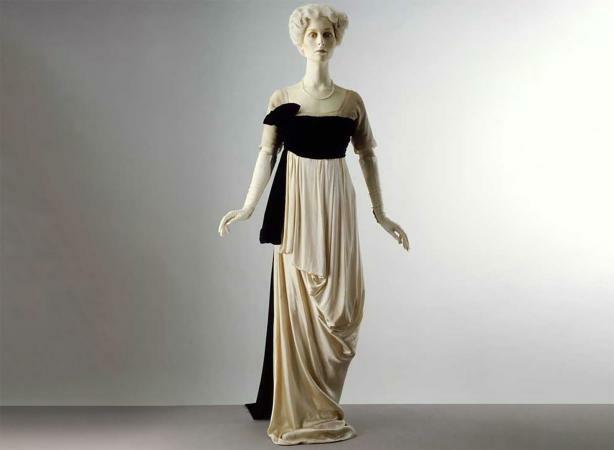 Duff-Gordon termed them "Gowns of Emotion," also referred to at the time as personality dresses. This oddity began in her wish to promote the idea that the clothes she made in her early career were individual to each client. As a working practice, this went against the model of practice for a couturier established by Worth, who always decided the blueprint of what all fashionable woman should wear. Duff-Gordon's approach suggested that the inspiration of what could be termed fashionable was drawn from the innate quality of each of her clients individually; a dress that could suit their personality rather than their needs. Lucile's Gowns of Emotions were given titles such as The Captain's Whiskers, The Sighing Sound of Lips Unsatisfied, and Twilight and Memories. In associating the appearance of a dress with an inner state of mind, the disassociation of dress from social hierarchy and towards signifying a psychological state began. What is also notable about Lucile's titles is their similarity to the themes of love found in the salacious novels written by Duff-Gordon's sister, Elinor Glyn, who also wore her sister's designs. Many of Glyn's fashionable works featured well-dressed women with descriptions that faithfully aped the latest designs of Maison Lucile. Duff-Gordon's last epic was not to be literary invention. In 1912 she survived the inaugural trip of the Titanic. For her husband, who also survived after joining her in a rescue boat intended for women and children only, it led to the end of his reputation. For Duff-Gordon it was the final chapter in a sensationalized career. To distance herself from the tragedy of the Titanic, Lady Duff-Gordon moved her career to New York where her models came to the attention of Florenz Ziegfeld in 1916. Ziegfeld persuaded Duff-Gordon to let her models wear her creations in his current Follies. She designed the costumes until 1920. See also Haute Couture; Tea Gown; Theatrical Costume. Cecil Beaton. The Glass of Fashion. London: Weidenfeld and Nicolson, 1954. Duff-Gordon, Lady. Discretions and Indiscretions. London: Jarrolds, 1932. Etherington-Smith, Meredith, and Jeremy Pilcher. The It Girls: Lucy, Lady Duff Gordon, the Couturière 'Lucile' and Elinor Glyn, Romantic Novelist. London: Hamilton, 1986. Glyn, Elinor. Three Weeks. London: Duckworth and Company, 1907.